Happy New Year from Big Sky Quilts!!! 2018 brings new classes, special events and more opportunities for creativity. SAVE THE DATES FOR THIS POPULAR EDUCATIONAL OPPORTUNITY!!! Purchase a JanomeHorizon Memory Craft 9400 or Memory Craft 6700P sewing machine at great savings and receive a free gift of a universal sewing table valued at $599.00. Visit the shop to check out special pricing on other Janome sewing, embroidery and quilting machines. Longarm quilting is now available. Bring in your completed quilt top, select quilting design, backing and binding. We will finish it for you. You can never have too many tote bags hanging around. These bags are just the right size to carry your necessities for a day on the town, sewing class or for to look fabulous. This class focuses on stacking and whacking your fabric as we build your masterpiece. 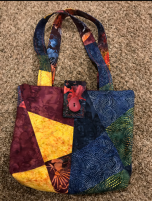 Use 6 fat quarters, ½ yard coordinating lining fabric and 5/8 yard fusible fleece to construct this fun tote bag. The class will use the Stack and Wack technique. Embellish your bag with colorful top stitching and a fun button. You will need to have basic sewing and quilting supplies including a rotary cutter, long ruler and sewing machine with 2 bobbins and walking foot. This colorful, modern quilt will be constructed over 4 months, January 2018 through April 2018. Starting January 23rd the class will meet Tuesday evenings twice a month to receive at least 2 blocks to be constructed prior to the next class. 8 basic blocks in 2 color variations for a total of 16 blocks will be joined together to form an impressive panel, 30” by 40”, to be surrounded by a neutral background. You have the option to select the finished size of your quilt. Designer Judy Livingston used a binding made from the 12 different colored fabrics used for the blocks. Seating is Limited REGISTER NOW!